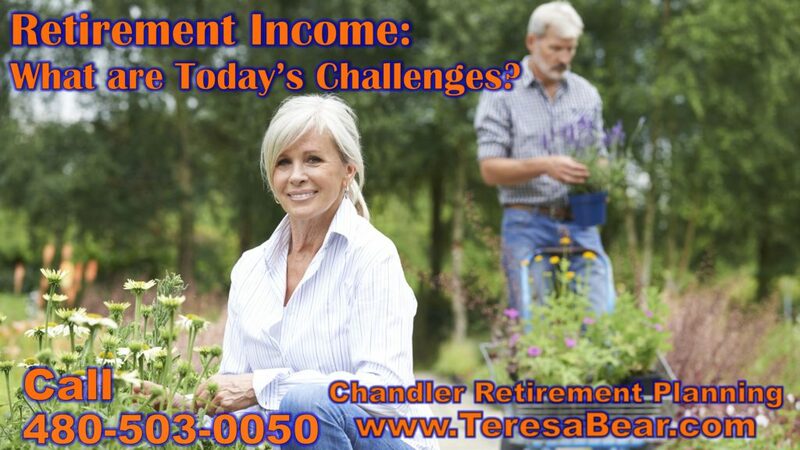 CHANDLER RETIREMENT PLANNING HELP CHANDLER ARIZONA RETIREMENT PLANNING CHANDLER RETIREMENT PLANNER HELP – RETIREMENT PLANNER CHANDLER AZ http://www.TeresaBear.com 480-503-0050 Chandler Retirement Planner Blog Discusses Retirement Income Challenges. Here’s some bad news: $135,000 isn’t enough savings for most people approaching retirement. Certainly, the less you have when you start retirement, the greater your risk of running out of retirement income. However, even those individuals who have saved diligently may want to consider a fixed income component to their financial strategy. By purchasing an annuity, even if they’re not ready to retire yet, pre-retirees can lock in a certain level of guaranteed income while still earning, saving and allowing other assets more time to grow. In fact, studies have shown that retirees experience more satisfaction in retirement if they are receiving guaranteed income from pensions or annuities, a feeling that is likely brought on by the certainty of continuous income.5 If you’d like to learn more about the role an annuity can play in your overall financial strategy, please give us a call. 1 Bernice Napach. ThinkAdvisor. Oct. 10, 2017. “Retirement Assets of Many Households Fell Between 2013 and 2016: CRR.” http://www.thinkadvisor.com/2017/10/10/retirement-assets-of-many-households-fell-between. Accessed Oct. 24, 2017. 5 Walter Updegrave. CNN. Aug. 23, 2017. “Do you need an annuity?” http://money.cnn.com/2017/08/23/retirement/retirement-annuity/index.html. Accessed Oct. 24, 2017. 6 Michael S. Fischer. ThinkAdvisor. Sept. 22, 2017. “Clients Like Guaranteed Lifetime Income but Not Annuities: Report.” http://www.thinkadvisor.com/2017/09/22/clients-like-guaranteed-lifetime-income-but-not-an. Accessed Oct. 24, 2017. Annuities are insurance products that may be subject to fees, surrender charges and holding periods which vary by company. Annuities are not a deposit of nor are they insured by any bank, the FDIC, NCUA, or by any federal government agency. Annuities are designed for retirement or other long-term needs. Annuity product guarantees are backed by the financial strength and claims-paying ability of the issuing insurance company.